Setup Windows Task Scheduler in Batch Mode (i.e. Run whether user is logged on or not) may raise error 0xC0000142 even using a simple batch file to output to a file. If the same task is set to run in interactive mode, the task runs successfully. Running Windows Task Scheduler in Batch mode (i.e. “Run whether user is logged on or not”) fail with error 0xC0000142 but it run successfully in interactive mode. Error 0xC0000142 resolves to STATUS_DLL_INIT_FAILED in the native API. In simple terms, this error raises as it was unable to load or initialize a critical DLL due to DLL mismatch, subsystem failure, or load successfully but fails to initialize. Windows Task Scheduler fails to run in batch mode when the machine has run out of non-interactive desktop heap space. Rebooting the server may rectify the temporary problem until the desktop heap is again exhausted. Adjusting the size of the non-interactive desktop heap has been known to resolve this error permanently. The second SharedSection value (3072) controls the size of the desktop heap that is associated with an interactive window station (used for Windows objects). This static value is used to prevent ill- behaved applications from consuming too many resources. Because the desktop heap is mapped into each process’ address space, this value should not be set to an arbitrarily high value (as it would decrease performance), but should only be increased sufficiently to allow all the desired applications to run. The third SharedSection value (512) controls the size of the desktop heap for each desktop that is associated with a “non-interactive” window station. If this value is not present, the size of the desktop heap for non-interactive window stations will be same as the size specified for interactive window stations (the second SharedSection value). This registry value is only valid when the /3GB switch is not being used. The /3GB switch is specified in the boot.ini file. Special care should be taken when modifying the desktop heap settings. Only adjust upwards in 256 or 512 increments until the desktop heap errors have been resolved. Adjusting these values too high could have a potentially negative impact on server performance because fewer non-interactive sessions can be established. 3. 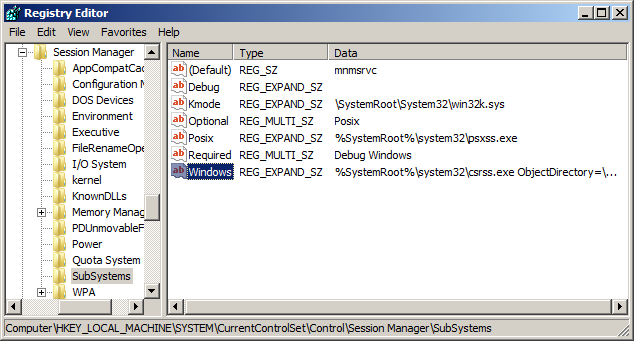 Click to modify the SubSystems\Windows value. 4. Locate the SharedSection parameter within the data of this value. This parameter will have 3 or 4 values. 6. Restart may be required to take effect.